Squash! 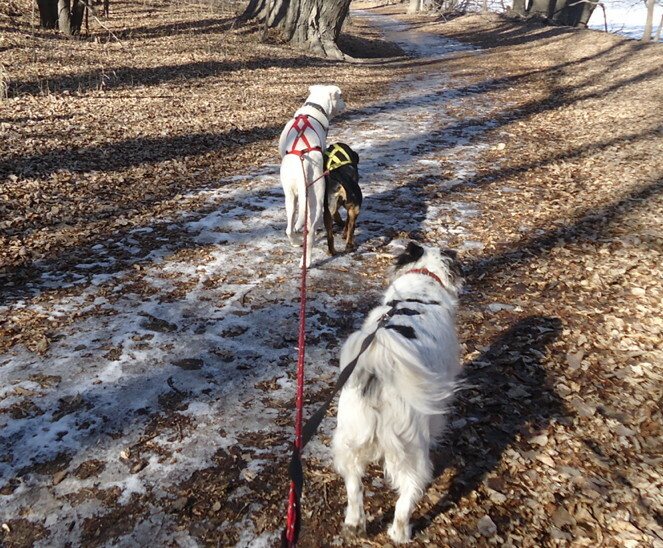 I’M FLYING… or, When All Else Fails, Canicross. I think I’ve made my displeasure at the lack of snow this winter quite clear. I’m not going to belabor it any more than is necessary to let off enough steam to prevent my head from pressurizing to the point of explosion. Mentioning it about once a day should suffice. Now, that’s not standing water. It’s ice. Lots and lots of ice. Don’t you love how the trail itself is the only thing with any substantial ice or snow left on it in this landscape? Me too, if by “don’t you love” you actually mean “aren’t you filled with blind rage at the sight of”. So anyway, I’m not really a natural runner. I’m short and short-waisted, my legs are stumpy, my default body shape brings to mind a nice baking potato, and I’m currently out of shape even for said potato. Now back in the day I did run. I even did a few 5K races. But I was young and it was a forced affair that ended by mutual agreement (that is, both my knees agreed) after a few years. Even at my youthful best, most people could probably walk nearly as fast as I can run and in any case that was years and years ago. But when nature behaves badly and you still have three dogs (and yourself) to exercise, sometimes you just have to make do. Enter canicross. Canicross is like skijoring without the skis, scootering without the scooter, sledding without the sled, bikejoring without the bike… well, you get it. It’s just hooking up the towline to your own self and running behind the dogs. Often when I am canicrossing it is actually my intention to walk behind the dogs, but since in their minds they are apparently still pulling a scooter (albeit a human-shaped scooter with legs instead of wheels) that slow pace simply does not fly. And I usually end up running. Especially now, when the dogs have been woefully underexercised due to a combination of the weather and Squash’s (recently lifted) exercise restrictions. The weird thing is this: I hate running. If I got up off this couch right now and tried to go for a run, it would simply not happen. I don’t think I would make it three blocks before crying UNCLE!. 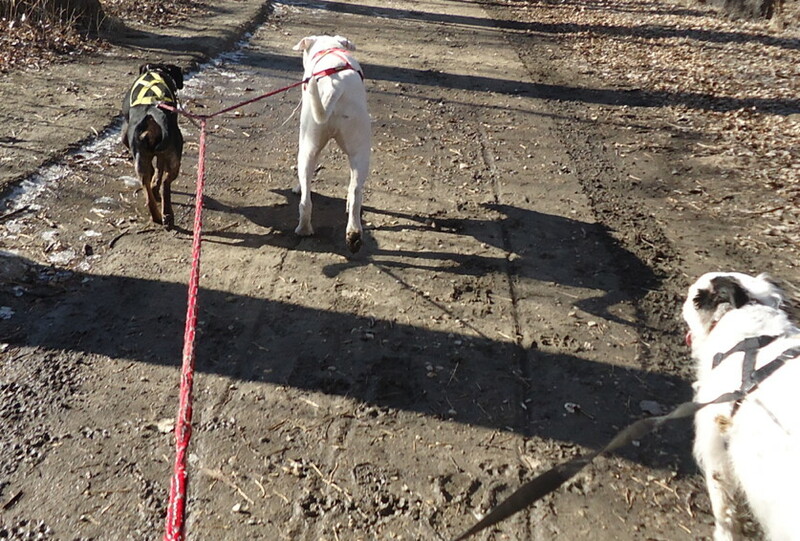 But this morning I packed those dogs up and we played canicross for almost 45 minutes, with me starting out by desperately trying to stick to walking but soon discovering that resistance against three eager dogs is indeed futile. Pretty soon I was jogging, and ended up jogging most of the way, and I loved it. Part of why this happens is that in canicross the dogs are still actually pulling you even though you are not on a scooter, sled, skis, or bike; at the point when both of your feet are off the ground, they are pulling you forward through the air and your stride is longer than it would be naturally. In a way you are ACTUALLY FLYING. At least that’s how I like to think about it, because if I think about it as getting jerked around by my skijor belt it sounds way less cool and quite frankly kind of dumb. The other part of why this happens, I think, is that there is so much to pay attention to rather than how tired I am and how much I actually hate jogging. 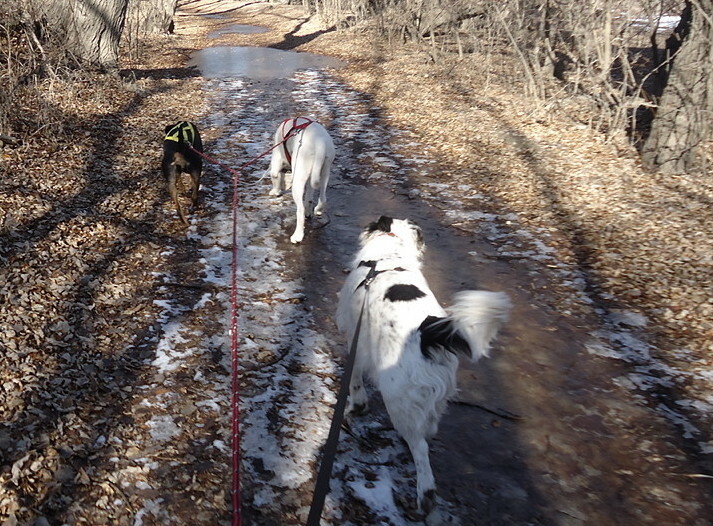 Since today almost every step might have lead to an icy doom, I had to pay attention to where my feet were going as well as paying attention to the dogs and what they were doing, giving commands, preventing or correcting tangles, keeping an eye out for wildlife, and so on. And Pip came along today so there was the potential for 1/3 more tangling than usual, giving me even more to pay attention to. Anyway, when we were done, I was tired and sweaty and spent. I had clearly exercised. But it didn’t feel like it while I was exercising, which is really pretty wonderful when I think about it. And although I wasn’t really looking for another reason to prove to myself that I have good reason to be in love with mushing sports of all kinds, I think I found one today buried in the ice and mud. I think we’ll go again tomorrow. This entry was posted in Canicross, Dog Talk. Bookmark the permalink.